September is upon us and for me it's all about transition and change as we move from one Season to another. I don't particularly welcome this slow goodbye to Summer but let's face it, with colder weather and shorter nights just around the corner, the majority of us will be spending more time indoors so now is a great time to focus full attention on the home. I like to change elements of my cottage interior with the Seasons so during the next few weeks I'll be prepping for Autumn by adding and changing cushions, switching Summer throws for thicker Winter ones and maybe including a textured rug or two for extra coziness, comfort and warmth. It's also time for to have the chimney swept and begin fetching some logs from the woodshed to fill my wonderful log basket from Graham & Green in anticipation of those cozy nights in front of the wood burner. To use my favourite analogy for this time of year, I see it as padding the nest ready for Autumn/Winter. I'm already inspired with launch of several AW13 collections including 1 The John Lewis Odyssey range of home ware featuring innovative materials, contrasting textures and natural patterns in soft graduated colours. 2 Is the exciting and vibrant range of gorgeous wool throws and cushions from Seven Gauge Studios, which are a must for brightening up those dark nights! 3 I also really like this colourful selection of throws from Designers Guild which are great for adding to a favourite armchair or layering up a bed. 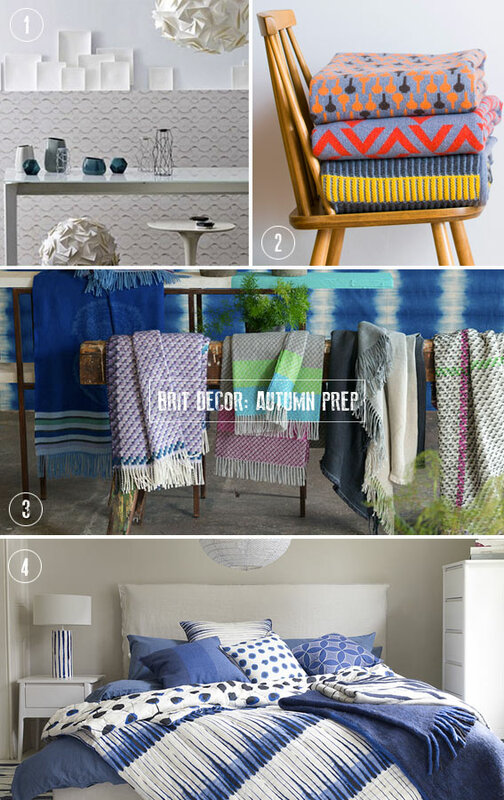 4 The colour blue is a long time personal favourite of mine so you can imagine my delight when I saw this AW13 bedroom setting from Habitat - it looks fresh and vibrant but equally is deeply layered with plenty of cushions and throws for added warmth and insulation. So what will you be doing to pad your nest this Autumn?